Relevant WhatsApp groups can be found on the Contact Us page. Relevant sailing committee contact are found on the Committee page. If you want thrills, speed and spills then dinghy sailing sailing is for you…be warned, you will get wet! Dinghies are small open sailing boats which are great fun for day sailing, racing or just mucking about. They come in all shapes and sizes and are an inexpensive way to enjoy being on the water. Optimist ( Oppie ) – Designed in 1947 by Clark Mills to offer low cost sailing for young people, it’s a classic. Imagine a 2.36 m (7 ft 9 in) bath tub with a sail. Perfect for younger kids learning how to sail. Wikipedia article. 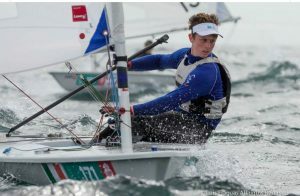 Laser (one) – One of the most popular single-handed dinghies in the world. A 4.2 m (13 ft 9 in) ‘one design’ which is fun to sail and easy to transport. Wikipedia article. Topper Topaz – A low maintenance plastic hulled dinghy suitable for 1-2 sailor. A robust dinghy, perfect for learning to sail. Topper Omega – A larger version of the Topaz suitable for group sailing. A robust dinghy, perfect for learning to sail. We all like to look good but fashion comes second to water safety. At sea exposure and fatigue set in quickly, wearing the right gear keeps you safe. These are meant as a rough guide only, what you wear will depend on conditions – talk to your instructor or more experienced club members if you are unsure. Buoyancy aid – Never sail without it. Keeps you afloat when you fall in. It’s important to use a vest style buoyancy aid suitable for dinghy sailing which allows free movement of the arms. Neoprene wetsuit – This is the lowest layer which insulates your body should you fall in. It should be 3 or 4mm and shorties are ok in warm weather. Sailing smock / cag – A windproof and waterproof layer which keeps the wind chill down and lets splashes roll off. Hiking shorts – These prevent the soft wetsuit material from abrasion. Neoprene gloves – Stops rope burn and keeps the fingers warm. Fingerless gloves are ok in warm weather. Neoprene sailing booties – Keeps toes and feet warm and protected, especially when hiking (leaning over the edge supported by toe straps). Thermal top – A thermal top over the wetsuit is a good idea on colder days. Be sure to use one that’s not going to retain a lot of water if you capsize. A beanie hat – For colder days a suitable hat. Be sure it’s suitable and keeps you warm even when wet. UV protection – Beware ! The suns effect is magnified at sea.. Don’t forget sun glasses, a cap & sun cream.